The first Monday of the month (See scheduled dates below) will be Jeans Day for the United Way. Faculty and staff are invited to donate to the United Way each month in order to wear jeans on Jeans Day. To participate, go to your campus library, and purchase the Jeans Day sticker for a suggested donation of $5. Then, wear the sticker and your jeans on the designated day. It is that simple. 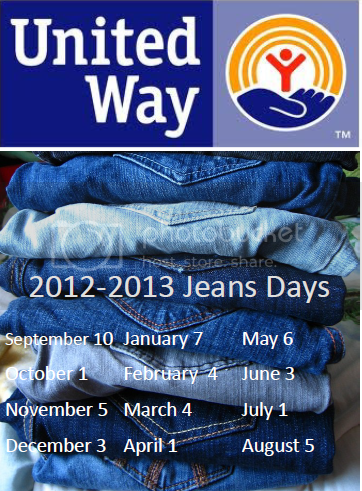 Wear jeans, and you help the United Way and the many local organizations receiving their funding. Please ask for your supervisor’s approval before participating. Questions? Contact Michelle Nielsen Ott, extension 5617.